Enter this amazing, gated property and you'll feel like you arrived to paradise! Situated on a private knoll looking out at open countryside and rolling hills, this modern built Victorian home is breathtaking and unique in its style. With a large wraparound deck, majestic views from almost every room, top quality construction with architectural details throughout, this one will not last! Property amenities include custom driveway & landscape; paneled living room with built-in bookcases and beautiful fireplace with custom hearth; exquisite dining room with built-ins, french doors to deck & views from every seat; chef's kitchen with plenty of storage; separate laundry room; beautiful master suite with sweeping views, sitting room & luxurious master bath (recently remodeled); beautiful hall bath (also recently renovated) and lovely bedrooms. The home also has an attached two car garage and plenty of outdoor parking. 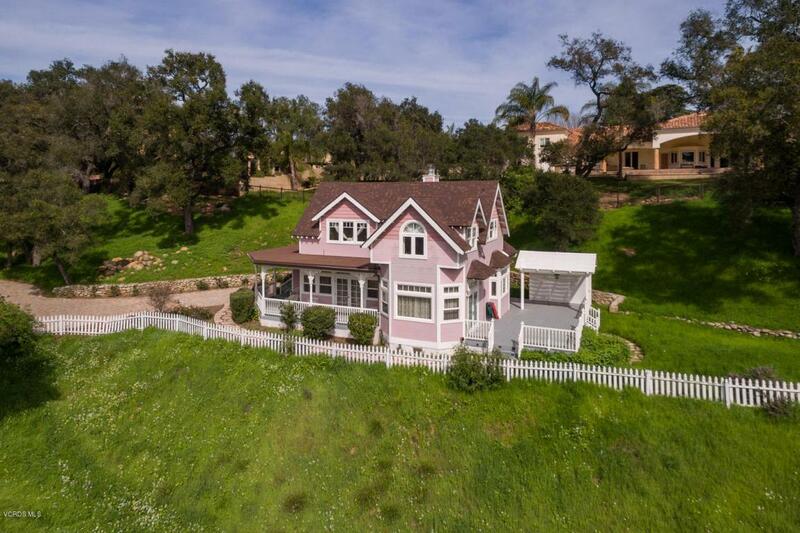 This property well situated in town, with easy access to grocery, shops, and restaurants; also within minutes of downtown Ojai and downtown Ventura & easy access to Carpinteria/Santa Barbara. A great forever home, or perfect weekend getaway spot, this type of property only comes up every few years... TRULY A MUST SEE! Sold by Rachelle Giuliani BRE#01458117 of Keller Williams West Ventura County.